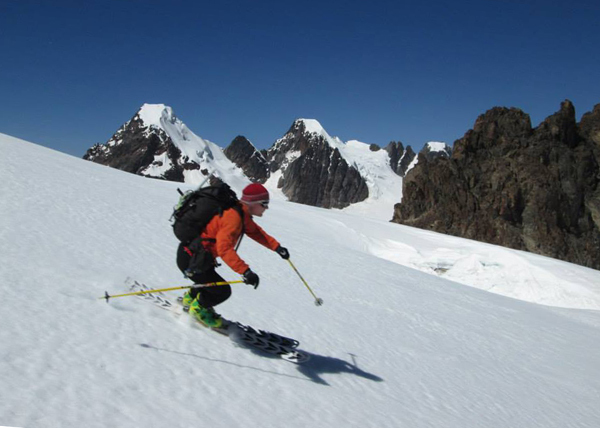 Exploratory Ski Mountaineering in Southern Peru. This itinerary visits a country and mountain range we know very well to explore some of the highest mountains on skis. We'll keep the itinerary fairly flexible to make the best use of snow conditions for ski-mountaineering, but plan to ski one high 5800m+ peak after an initial phase of skiing several 5000-5500m peaks. The expedition will fly out to Cuzco in southern Peru, the ancient capital of the Inca Empire and now a major tourist destination. Our first three days will be spent in this city and visiting nearby tourist attractions to acclimatise to the altitude. 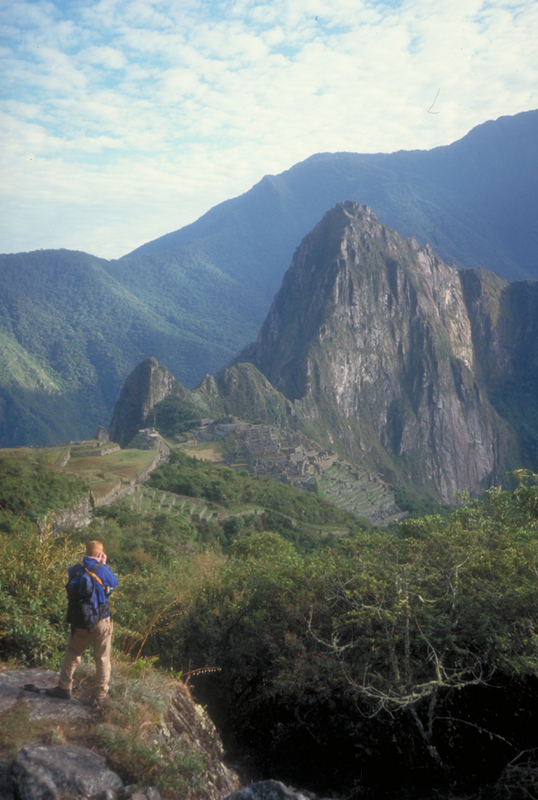 This will also include time for you to visit the nearby ruins of Machu Picchu as an optional day trip. From Cuzco we'll travel to the famous wee town of Tinqui on the northern flanks of the Vilcanota mountains. It's a wee place we know well, having been travelling there regularly since 1995. 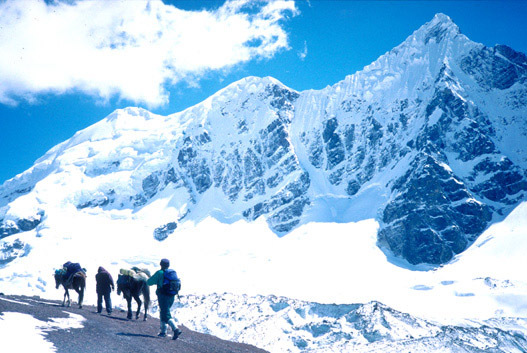 From Tinqui we'll make one long trip into the Vilcanota mountains with two different base camp areas. From the first of these at Pachaspata we'll aim to ski peaks such as Mariposa Sur, Campa and Camap II, all of which are in the range of 5400m or so high. Then we'll transfer to a second base area at Asiro and make ascents on skis of Huayruro Punco, a 5500m peak and finally our big peak of Jatunhuma II, at about 5800m. Walks between Tinqui and the two base camp areas are typically about a day long and will be fully supported by mules/horses. Expedition members must be strong alpine skiers, able to ski black runs confidently and in full control. Previous touring experience and previous high altitude experience are also highly recommended (but neither is absolutely essential). However at least a little previous experience of using an ice-axe and crampons in a mountaineering setting is essential. 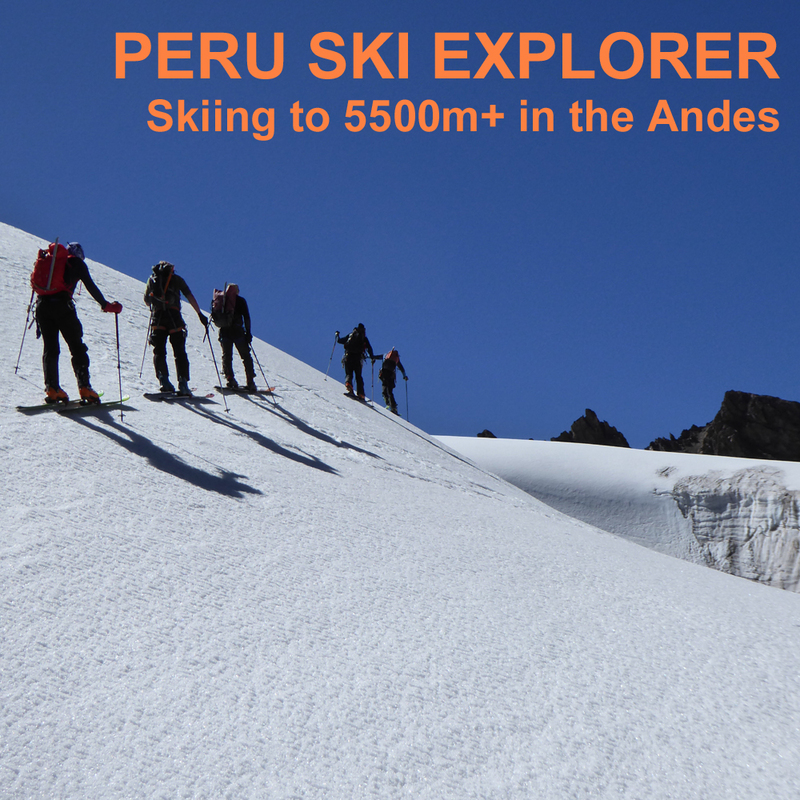 We will take our own skis out to Peru, you can bring either alpine, telemark or splitboard kit, but given the terrain we plan to ski on we strongly recommend Alpine touring kit. Day 1-2 Flights to Cuzco via Lima. Day 3-5 Exploring Cuzco and Machu Picchu. Day 6 Travel to Tinqui and the Cordillera Vilcanota. Day 8 Trek to Pachaspata. The ruins of Machu Picchu are located near Cuzco. It will be possible to visit this world famous archaeological site during our time in Cuzco, as an optional day trip. The former capital of the Inca Empire, Cuzco is one of the world's most fascinating cities. Many ruins from the days before the Spanish conquest of Peru are still visible in the city and surrounding foothills. There are countless examples of the Incas incredible skill as stone-masons. Huge granite blocks fit so well that a knife cannot be inserted between them. There are also some beautiful buildings in the city built by the early Spanish colonists, including the Cathedral and buildings around the main square. Because the city lies at an altitude of 3500m we'll spend four nights in Cuzco when we first arrive in Peru, getting used to the altitude. This will give us time to explore many of the ruins including the magnificent toothed fortress of Sacsayhuaman which sits on a hillside above the city and is a rival even to Machu Picchu. There will also be time to look around the markets of Cuzco and/or nearby towns. Anyone with a big interest in Inca history is of course welcome to extend their own itinerary by several days and we can give help and advice if you wish to do this. Machu Picchu (pictured above) was rediscovered by Hiram Bingham early this century when he was looking for a fabled 'lost' Inca city in the deep valleys around Cuzco. This is the most famous ruin in South America and not without reason. The setting is superb and the ruins themselves are extensive with many houses, temples and fortifications. The exact reason the Incas built Machu Picchu is not known (because they left no written records) but it was clearly a site of ceremonial importance. We will organise an optional excursion to Machu Picchu that will allow you a half day at the ruins. 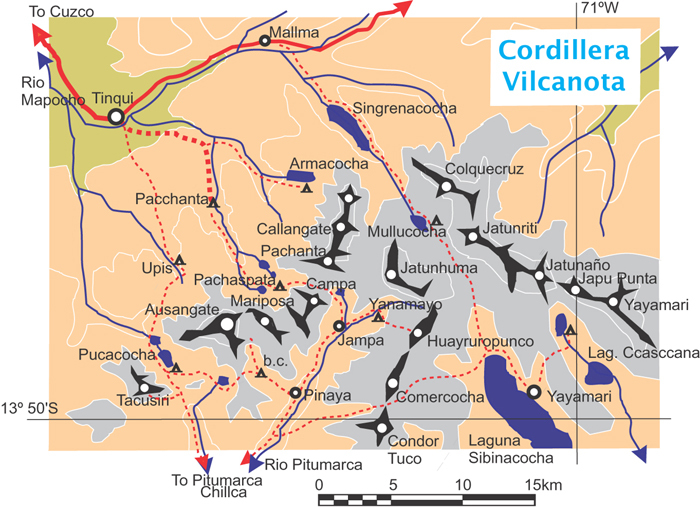 The Cordillera Vilcanota are a compact mountain range situated about 100km south east of Cuzco. They are perhaps the most rugged and remote mountains in Peru. 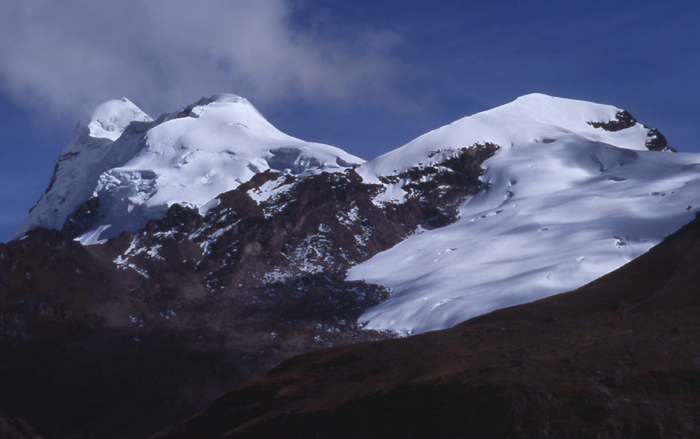 The range contains several peaks over 6000m high, including Ausangate the highest peak at 6384m. The lower valleys that we trek through have been glaciated in the past and many small lochs remain behind. There are some idyllic campsites. Most of the valleys in the Vilcanota are still used as pastures by the Quechua speaking Indians and we are sure to see llamas and alpacas grazing. We start and finish our mountain trip in the small village of Tinqui on the northern edge of the Vilcanota mountains. The trek to base camps will be fully supported, with horses or mules carrying all equipment, but is still a relatively strenuous undertaking because of the high passes (up to 5100m) that we will cross. Typically we'll be walking for six or seven hours per day when moving between camps. High altitude skiing in typical conditions in the Andes. This expedition is scheduled just at the end of the December-April wet season in this part of the Andes, but by May we can expect generally stable weather. However there can sometimes be windy days and light snow flurries. This time of year is early winter in Peru; during the day it normally feels pleasantly warm in the strong sunshine, but cool or cold if it gets windy. At night temperatures at altitude go down to -10ºC during the 12 hours of darkness. Bring a warm sleeping bag and a good book! Clients should be very experienced skiers and mountaineers. At least a little previous mountaineering experience, using an ice-axe and crampons, is essential. Expedition members need to be reasonably fit as we will be climbing and skiing at high altitudes. Climbing to nearly 6000m is always hard physical work and the summit day on our biggest peak is likely to be over 10 hours long. However we should stress that you don't need to be an olympic athlete! Cold nights, cold washing water and some tinned and dried food are a few of the experiences which will have to be enjoyed or endured. Because this is a tropical ski trip it definitely won't be "ski-in, ski-out" and we'll have to carry skis and boots from our base camps in the mountain valleys to the snowline on almost all of our peaks. This will typically be for 1-1½ hours at either end of the day. We will be using horses or mules to help establish base camps, so you won't need to carry full expedition rucksacks at any stage. All clients must be insured for medical costs and repatriation in an emergency. We recommend having insurance for baggage, personal liability and cancellation as well. If you would like advice on insurance please ask. Peru is one of the less developed countries in South America and it is a good idea to avoid tap water, unwashed fruit, ice and all seafood. Vaccinations for tetanus, typhoid, polio and hepatitis are needed! Malaria and yellow fever precautions are not necessary as we won't be visiting mosquito infested areas. Peru is a very friendly and relatively safe country to visit but it is important to stay alert when in busy public areas and to guard your belongings carefully. Muggings and violent crime against tourists are rare. We issue further advice on security to all clients before departure. Mariposa with Mariposa Sur on the right. Mariposa Sur is one of the peaks we are very likely to ski. Our price does NOT INCLUDE - your flights, your insurance, your hotel/hostel accommodation, your meals taken at cafes and restaurants, your share of communal travel costs (e.g. 4x4 rental, mule costs), your personal climbing, skiing and camping equipment (i.e. used by you alone, such as sleeping bag, ice-axe, crampons), permits or peak fees payable by yourself. Driving, hotels and general safety : In Peru driving, health, fire safety standards and general safety standards are not as high nearly as in Europe. Minor slips and falls : due to steep, uneven and unstable ground. There is always a considerable risk of injury when skiing off-piste due to the unpredictable nature of the terrain and snowpack. Mountain Hazards : In certain places you may be subjected to a slight risk of rock slips. During and after stormy weather there may be a risk of avalanche. There is also a risk from crevasse falls on most of the ascents in this itinerary. Campa pass in the Vilcanota mountains.